Before moving to Los Angeles, hiking wasn’t on our regular rotation of things to do. However, we quickly learned that it was *the* thing to do in LA. With limited funds and a desire to explore as much of this massive city as we could, hiking turned into a regular family outing. Being total novices, we made our share of mistakes, but over time we learned some tricks to keep the little legs moving without the moaning! At 4.5 years old, my son completed his first 5 mile hike. The last 1/2 mile had a bit of moaning, but it wasn’t just coming from him, so I can’t fault him too much! Read on for more on how we keep our little one going while hiking. Note: This post may contain affiliate links. By purchasing items through these links, I will receive a small commission at no additional cost to you. Start hiking with your kids when they are young. If you are comfortable in a carrier, go for long hikes with the baby on your back. Being out in nature from a young age does nothing but good for the little one’s brains. If your kid is out of carrier age, pick trails that are easy to use a stroller or push car so the kids can walk when they want or ride when they get tired. Hiking from a young age also helps kids get used to being outdoors and exploring the wilderness. 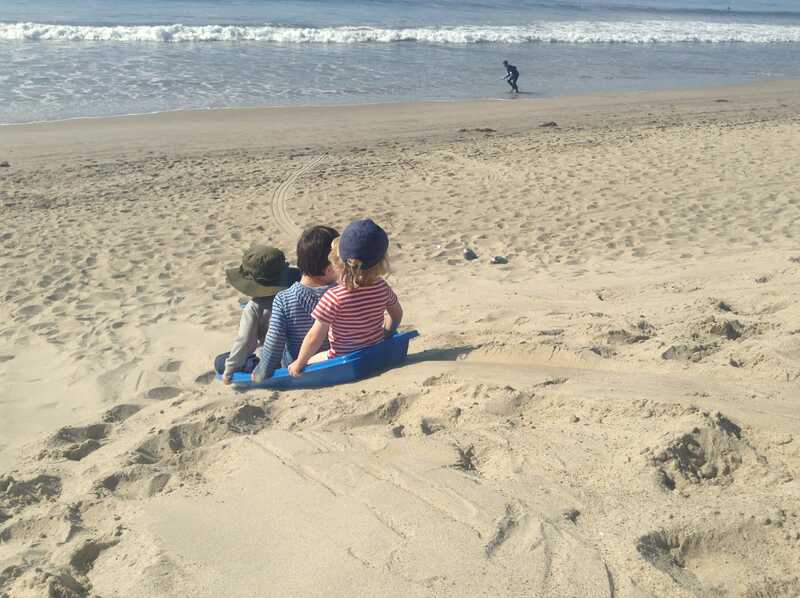 We loved the ease of using a push car since it allowed my son the ability to hop in/out at his leisure. 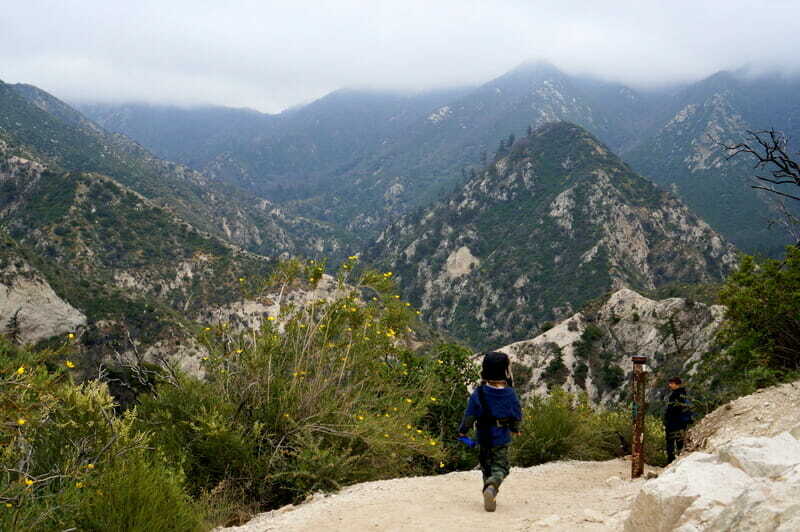 For some ideas on good trails for toddlers, read our post on our favorite Los Angeles hikes. One of the most important aspects for keeping kids engaged in hiking is to choose interesting trails. 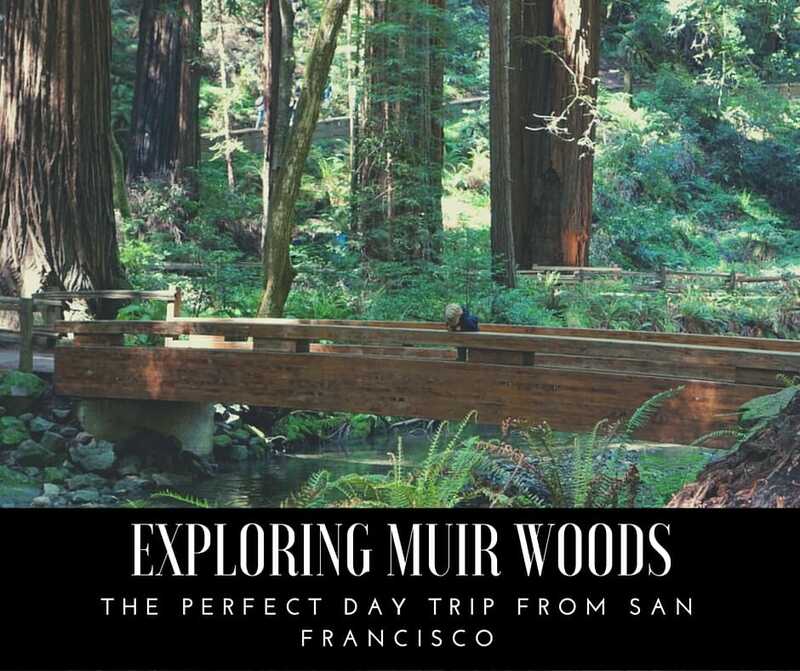 Trails with water, an abundance of animals or things to climb are always a hit with children. Puddle jumping and searching for animals is a great way to keep kids engaged. 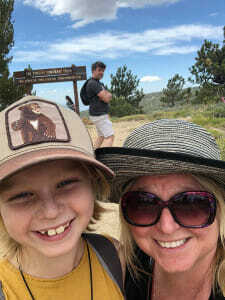 Over time we found that our son moaned a lot more on well manicured trails, whereas once we were off the beaten path on more rugged rocky trails, where he could hop over rocks, jump streams, etc he was more engaged and excited. He craved actual adventure, not walking on a straight path with hordes of others! Try different types of hikes to see what your children enjoy the most – hikes that end at beaches, mountain tops or waterfalls are good places to start. One of the first things I learned hiking with my son was that it’s not the destination that matters, rather the journey. If you focus on completing the hike or getting to a certain point, it can cause massive amounts of frustration for all involved. When starting out, it’s best to focus on just being out enjoying the outdoors. Let the littles stop when they want to to check out tiny flowers or caterpillars. Just focus on enjoying being outside with your family. Start small by trying trails that are shorter and more tailored to the youngest member of the family. Make a deal with older kids that when they are getting too tired you will turn around and head back. Don’t worry about finishing the trail, there is always next time. For hikers of all ages, one of the most important things is to be prepared with food and water. There is nothing worse than being out on a trail with a hungry or thirsty child (or mama for that matter!). A short little hike could turn into several hours, so bring a lot more than you think you will need. I can’t tell you how many times a quick stroll has turned into a 3 hour hike. We love the camelback water backpack for our son now. He enjoys having easy access to his water and ends up drinking even more than normal when wearing the pack. Be prepared for a variety of seasons. Rain wear, cold weather clothes and a pack towel for those mishaps in the streams! We also always include a small medical kit just in case of any boo boos along the way. Let the kids also pack a few ‘essentials’ to make the hike more enjoyable for them. Think magnifying glasses, bug catchers, binoculars or kids cameras. My son likes to take a collection bag as well to collect samples along the way. If your kids are socially minded, add in a disposable plastic bag to collect trash along the trail. This can also act as a “game” which motivates the kids to keep moving as they are looking for more trash to pick up. One of the best ways to increase the distance you can go with kids is by playing games. Geocaching is a favorite for our family, especially while on a trail. (Note: On many trails, phone service is spotty, so an actual GPS unit is best for this.) Looking for a little box with possible goodies in it helps distract the little ones and gives them something to look forward to. We also found that as the hike was coming to a close and little legs were getting tired a good way to make up ground quickly was to play racing games. “Who can run to that sunny area first?” or “Race you to the big rock.” have worked well for our family. Lastly, think about printing out scavenger hunts, bingo or creating your own to do list for hikes, for example, “Find 5 different types of leaves” to keep them engaged and focused on a task other than worrying about how far they have walked or when the hike is over. Use your children’s own interests to create games to keep them moving. Do you have tips on how to keep the little legs moving? Share it with us below. I am envy to I am envy to all your experience in you article. I have two children. I can not make my wife and children accept to hike nearby town at weekend. I am going to try you geocaching play with my children. May be it would be work. That is a good idea. Thank you.all your experience in you article. I have two children. I can not make my wife and children accept to hike nearby town at weekend. I am going to try you geocaching play with my children. May be it would be work. That is a good idea. Thank you. Your guides help me lot. I never try hiking with kids. But after reading this article I think hiking will be a good practice for kids. I will try to go as soon as I can. My son will be surprised after knowing this news. Thank you. 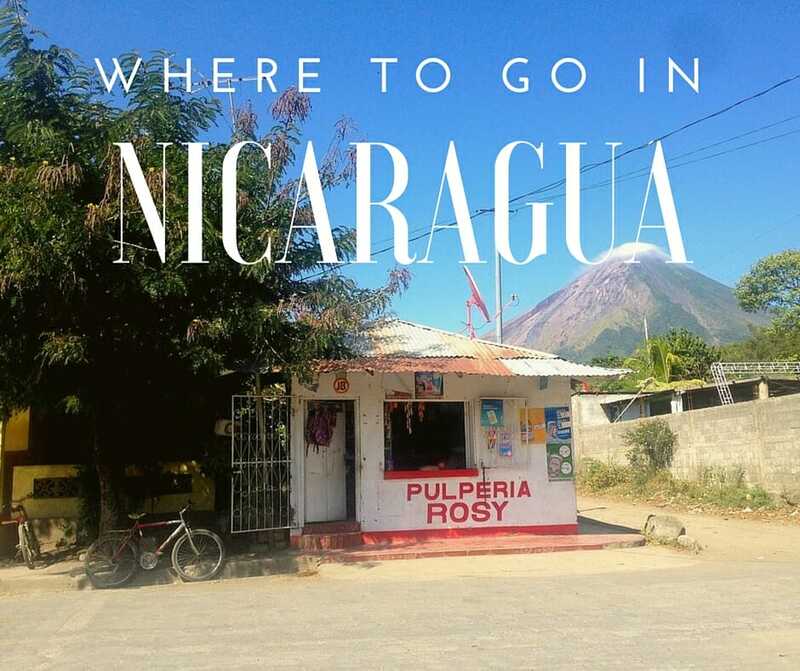 lovely blog post, beautiful photos and great tips! I’m not much of a hiker, but I do love being in the mountains. Nothing like fresh mountain air! !your baby so cute. I love that you are spending your time with your kids hiking and camping with then you doing a great job. This will make them more curious humans and nature loving.. If you have younger children, be sure to use a hiking backpack for kids. We loved Kelty hiking carrier and it helped us enjoy lots of hikes with the kids.